Our product range includes a wide range of kitchen casseroles, fusion casserole set of 4 pieces, kitchen casseroles set, fusion food warmer set of 4 pcs. 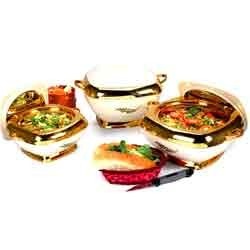 golden colour, fusion food warmer set of 3 pcs. 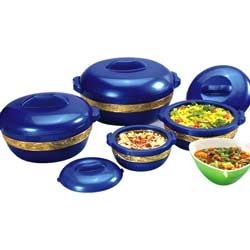 and fusion hot pot set of 4 pcs blue colour. Available with us is an attractively designed collection of Kitchen Casseroles. 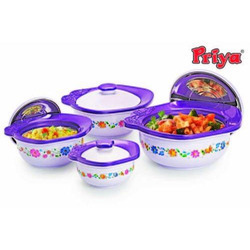 These sets are designed keeping in mind the exact requirements of customers using high quality food grade plastic. These casseroles help in keeping the food hot for a longer period of time. Clients can avail our range in variegated specifications at pocket friendly rates. Growing rapidly as a manufacturer, supplier and exporter, we are engrossed in offering Kitchen Casseroles. Extensively used in household sectors, these casseroles are developed with the aid of modern machinery and equipment that is operated by our team of experts. Developed in compliance with the industry set norms and guidelines, these products are widely demanded in the global markets. Capacity: 1000, 2000, 3000 ml. Fusion Casseroles are made from top quality raw materials which are food grade in nature. The mirror finished stainless steel has non-magnetic properties which is safe for keeping food. The Plastic components used are made out of virgin polypropelyene which gives a sturdy and beautiful finish. Insulating materials are sourced from all over the world keeping in mind the latest technological developments. Transfer hot food directly from cooking vessel to the Fusion casserole right upto the brim and close the lid tightly, this will ensure maximum heat retention and will keep food fresh for hours. Always fill to capacity for best results. Fusion casserole serves to preserve cold food too. It can also be used as a yogurt maker. Pour pure milk at lukewarm temperature, add a little yogurt and place the lid cover on top partially open to allow the moisture to escape. After all the moisture has escaped close the lid tightly. Thick yogurt will be formed in 4 hours. Ideal for pav bhaji, pulao, biryani, Dal tadka, steamed rice, aloo gobi, Roti etc. Food items like muffins and sandwich breads should be wrapped with a clean cloth before placing in the Fusion casserole to prevent them from getting soggy. Do not use over burning stove nor expose it to flames. Use a sponge instead of brush for cleaning. Our customers can avail from us a wide range of Kitchen Casseroles Set for which, we are considered to be reliable manufacturer, supplier and exporter. By utilizing optimum-grade components like stainless steel and plastic in the manufacturing process, we aim to attain highest benchmarks of quality. Additionally, we manufacture the entire range as per the prevailing trends of the industry. To meet the variegated demands of customers as a manufacturer, supplier and exporter, we are engaged in offering Kitchen Casseroles to manufacture these products, we make use of high-grade material and advanced technology to ensure highest benchmarks of quality. To fulfill the exact demands of customers, we manufacture these products working in close coordination with them. Our reputation as a manufacturer, supplier and exporter is showcased in our offered Kitchen Casseroles. Trendy and stylish, these casseroles are designed with the aid of modern tools and cutting-edge technology. 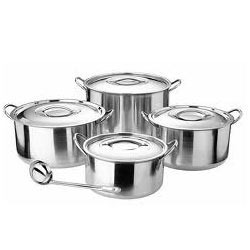 To suit the variegated demands of customers, we offer these casseroles in different specifications. Capacity: 500, 850, 1500 and 1000 ml. Packaging Details: Fancy Casseroles have superior packing, and inner printed boxes, also shipper cartons. Appreciated among our customers as manufacturers, suppliers and exporters, we are engrossed in offering our clients with a wide range of Kitchen Casseroles. Sturdy in design, these sets are designed by our team of dedicated and hardworking professionals. Moreover, these sets are checked on various parameters to ensure flawlessness. Applauded by our customers for manufacturing, supplying and exporting, we are engrossed in offering our customers with Kitchen Casseroles. 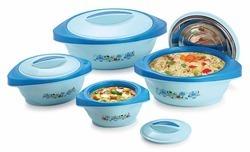 Perfect in finish, these casseroles are used to kept any snacks or food to keep it fresh. To suit the variegated demands of customers, we offer these products in different colors and sizes as per the requirements. Committed to manufacture, supply and export best-in-class products, we are engrossed in offering a commendable range of Kitchen Casseroles. Designing these products under the guidance of expert professionals, we aim to meet the exact demands of our clients. Providing customization facility for these products, we have gained maximum satisfaction of our customers. With the help of our distinguished professionals, we have been able to manufacture, supply and export superior quality Kitchen Casseroles. Our experts make use of optimum quality food grade plastic that is sourced from most authentic vendors of the market. The offered products have maximum temperature retention properties and stainless steel inside lids. Made available by us is quality approved Kitchen Casseroles - Latest machines and advanced technology are employed by our experienced professionals to manufacture these casseroles. 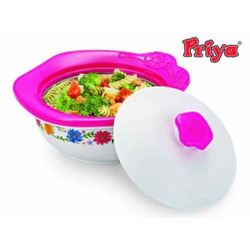 In compliance with international quality standards; these casseroles are available in variegated colors, designs and capacities at most competitive prices. 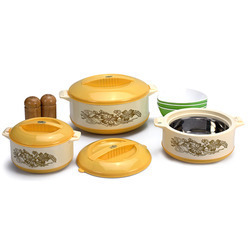 Fusion Food Warmer set of 4 pcs. golden colour is the latest addition to priya catalogue for export market. This product has attractive colours and designs keeping in mind the need of the buyers. Excellent fitment and quirky shape make this product a hit in a lot of markets. 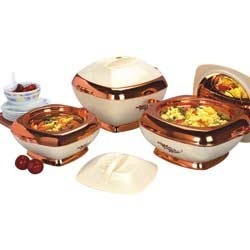 Fusion Food Warmer Set Of 3 Pcs. Fusion food warmer set of 3 pcs. is a very attractive casserole. Having received overwhelming response from the middle east markets, this hot pot will now be launched in the african markets. 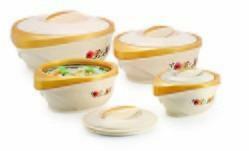 Fusion hot pot set of 4 pcs. Blue colour is the latest addition in the Priya Catalog. 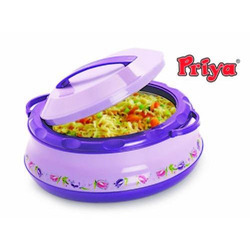 This product has newer colours and designs as compared to other priya hot pots. Good quality and excellent fitment makes this product an attractive addition to the product range.